If you love a little hand-painting then I hope you will enjoy my latest piece, fusing furniture painting and hand-painting artistry. 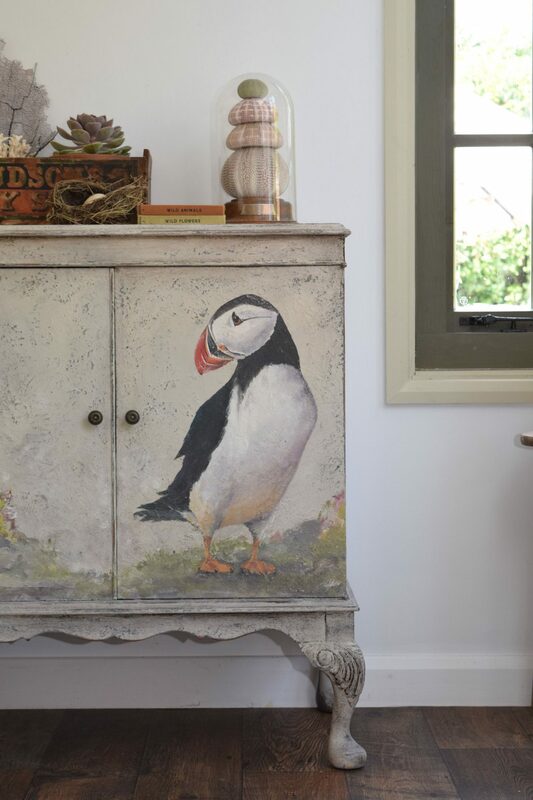 When I was asked to become global ambassador for Saltwash, I told founders Carol and Jaime that I would steer away from their coastal vibe, but the sea just kept calling me and the idea for painting my Puffin piece was born! These charismatic birds can be found in the British Isles on the North Coast, probably nearest to me is Bempton Cliffs in Yorkshire. I’m really excited at how it turned out. So how do I go about creating something like this? Lots of you tell me you don’t have the skills to paint with this level of confidence but I would urge you to give it a try. I’m totally self taught and have learned to paint by watching others and trying to replicate images from books, magazines and online. I did a Facebook Live on the process of painting this cabinet which might be useful for you to watch. 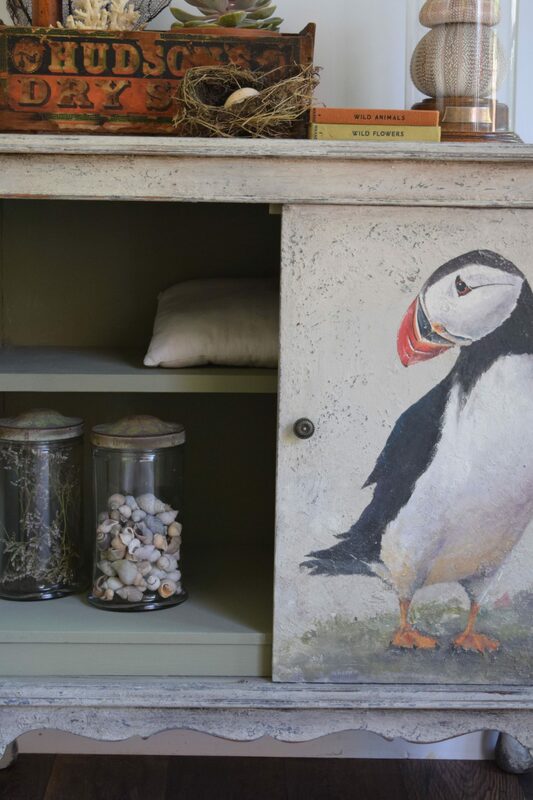 It includes lots of hints and tips on how I find my imagery, the brushes and techniques I use and how I created the surface on which to paint using Annie Sloan French Linen and Graphite with Saltwash. On this close up you can see the texture in more detail. 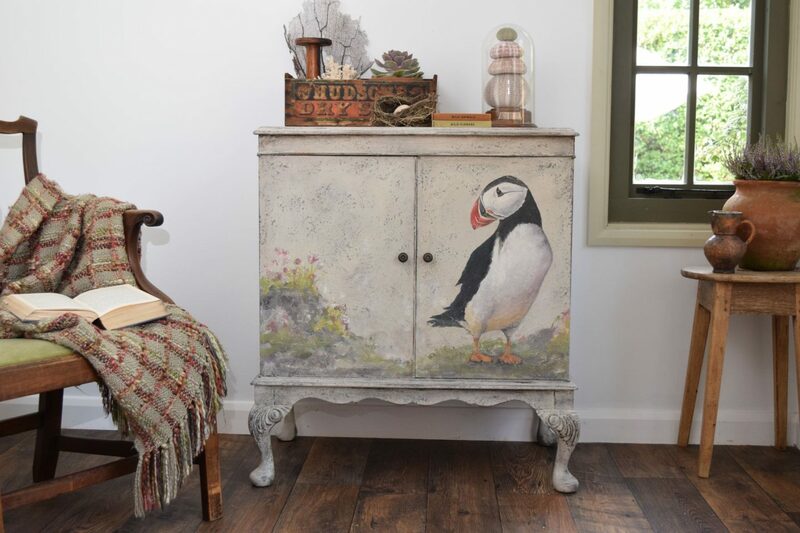 I was super nervous about rubbing back as I was really happy with how my puffin had worked out, so I sanded very gently around him, leaving most of his detail intact, then sanded back my neutral top coat creating texture and revealing the layered colours on the flat surfaces. For styling, I allowed the context to inform my choices – shells, sea urchins. seaside blankets, books and a little bird’s next that I found in my garden. I really loved doing this nature inspired piece. At this point I’m unsure whether to keep him or add him to my Etsy shop as I feel he’d be most at home in a seaside setting. If you’re interested in learning how to hand-paint with ease and without being an artist, my Hand-Painting Masterclass will take you through step by step to create your own pieces with an HD video and support resources including Materials, Hints & Hacks and Styling Tips. To buy any tutorial you need to be registered which will also give you my Free Marble Tutorial too. All workshops are available online in my Painted Love Academy for as long as you wish. Next Post Happy Halloween fall into autumn with some decorative pumpkin painting!